Click here for Registration Info. Participants will receive access to Mike’s Aesthetic Categories online instructional video to help them prepare for the workshop. The video explains and illustrates the 7 principles Mike utilizes in his painting. 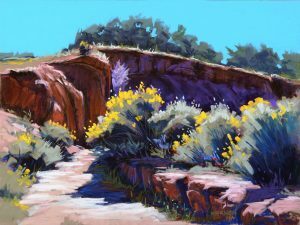 These principles take the artist through the entire painting process from start to finish and is the source of Mike’s highly acclaimed painting and teaching success. 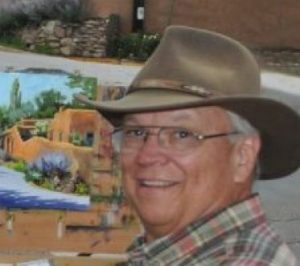 Mike has been a professional artist for 48 years and has been teaching painting workshops for the last 18 years. He has won many awards for his work including many best-of-shows and has taught and exhibited in various museums in Texas and California. His work is recognized for its strong sense of design and dynamic and painterly use of color and value. Mike has had great success using Paint-Alongs to teach his painting process. The more controlled step-by-step procedure of a paint-along is very encouraging to those who want to master the seemingly contradictory qualities of control and spontaneity. He will begin with an introduction explaining the painting principles and procedures necessary for successful painting. After a question and answer session, Mike will do a large scale demonstration from a photo resource. Following the demonstration, Mike will supply each student the same photo reference he used. Mike will then lead everyone in his step-by-step painting process. He has found that this is the fastest and most effective way to build confidence while learning his painting method. In addition to the paint-alongs, students will work from their own reference photos. Your ability to judge values, colors, and perspective will greatly increase. You will learn how to edit your photo source to the essential elements for the most successful painting. You will also be introduced to Mike’s “Aesthetic Categories” ©, a 7-step systematic approach to painting based on classical principles of art which are logical, easy to learn, and memorable. This systematic process will free you to be more spontaneous, while still in control of your painting. You will learn the necessary steps and the order in which they must be used to accomplish a good painting. In addition to Mike’s personal instruction, videos of Mike’s demonstration will be made available at no charge to those interested in re-living and reviewing the learning experience received, for years to come. Click here to view Mike’s time-lapse video of a landscape painting demonstration. This demonstration video compresses a 2 hour demonstration by Mike to only 9 minutes, but it includes much of Mike’s audio commentary explaining his painting process, along with helpful painting tips. You may view the video as often as you like. Click on the Youtube logo below to see more videos and subscribe if you want to see more as he produces them. Your success is Mike’s goal! “…You are one of the hardest working artists I’ve ever known, bar none. Not only did you spend every minute talking us through the fine points of scaling art to fit a canvas, but you did two paintings of your own AND spent time with each of us, from the oil neophyte to the more advanced oil painters in the group. “Mike, you have a great teaching persona. I think you have given me some great insights in to how my students feel! And I think I’ve learned some good things to pass on to my students! Joy Russo, Hot Springs, Ark. 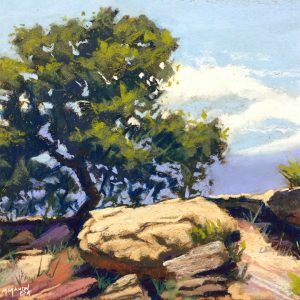 As a signature member of the Pastel Society of America, Pastel Society of New Mexico and the Plein Air Painters of New Mexico, Mike is the perfect instructor to advance your painting skills in producing landscape paintings. To register click the link below. Be prepared for an intense learning experience. Mike teaches a process rather than a technique, and students consistently rave over their results. This workshop is beginner & intermediate friendly, but because of his unique and thorough presentation of classic painting principles, it will be challenging even for experienced painters. 1. Exclusive access to a one hour video on his 7 principles of painting. 2. Exclusive access to a 3 part video on how Mike prepares his limited palette for oil painting. 3. A PDF pastel painting lesson for beginners and suggestions on organizing pastels prior to the workshop. Mike’s demonstration paintings and paint-alongs will be videoed at the workshop. Some of these videos will be made available exclusively to the students following the workshop. This additional resource will help you relive and review your workshop experience for years to come. Mike has had great success using Paint-Alongs to teach his painting process. The more controlled step-by-step procedure of a paint-along is very encouraging to those who want to master the seemingly contradictory qualities of control and spontaneity. You will learn how to think in Aesthetic Categories which form the foundation of all forms of art. 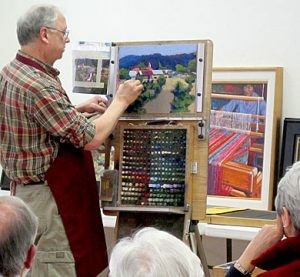 Mike will begin with an introductory PowerPoint presentation explaining painting principles and procedures necessary for successful painting, a question and answer session, and then will do a painting demonstration showing the principles he has explained. After lunch, Mike will review your supplies and equipment and help you set up for a paint-along. He will hand out landscape pictures for each student that are identical to the one he will be using. 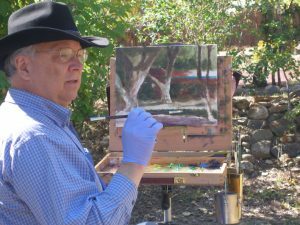 Mike will demonstrate his step-by-step painting process, stopping at each step to allow you to reproduce what you have just seen him paint. He has found that this is the fastest and most effective way to build confidence while learning his painting method. On the second day, Mike will briefly review the material he has taught and have a short Powerpoint teaching session. Everyone will begin another paint-along demonstration. In the afternoon you will begin working on scenes from your own photo references. Everyone will continue working on paintings done from their own source material. Mike will work with each artist to determine how to choose the best photo and how to crop it. Throughout the week, he will have short lectures or presentations on measuring techniques and other technical issues. Students will continue working on paintings from their own source material. At the end of the day, there will be a comprehensive class critique of all the work produced during the workshop. Many artists consider this one of the most useful sessions of the workshop experience. Throughout this week, your ability to judge values, colors, and perspective will greatly increase and you will learn how to edit what you paint to the most essential elements for the most successful painting. You will also be introduced to Mike’s “Aesthetic Categories” ©, a 7-step systematic approach to painting based on classical principles of art which are logical, learnable, and memorable. This systematic process will free you to be more spontaneous, while still in control of your painting. You will learn the necessary steps and the order in which they must be used to accomplish a good painting. Each student will receive a newly edited and updated workbook that covers the material presented at the workshop. Mike Mahon paints in plein air. Participants will receive in advance access to Mike’s Aesthetic Categories online instructional video and videos on preparation of oil limited palette and PDF on pastels. The Aesthetic Categories video explains and illustrates the 7 principles Mike utilizes in his painting. These principles take the artist through the entire painting process from start to finish and is the source of Mike’s highly acclaimed painting and teaching success. 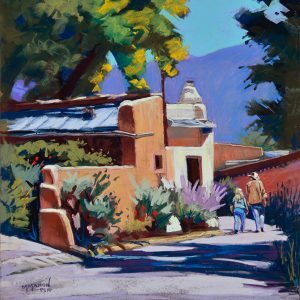 Mike’s yearly workshop in Taos is always an anticipated event for his followers, and this year the El Monte Sagrado Hotel will be honoring Mike again with a FREE Reception/ Painting Demonstration in their beautiful Gallery Room, on Tuesday, October 15th, from 4:00-6:30 pm. At this reception, as students arrive before the first full day of the workshop on Wednesday, Mike will be introducing his workshop artists to the way he paints. He generously welcomes others in the Taos community who may also be interested in watching his fluid style take shape. 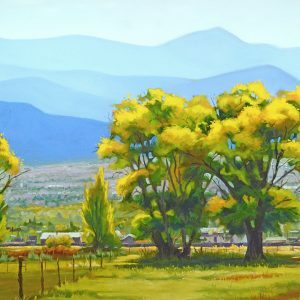 He will begin and finish a landscape painting from one of his favorite photos of the Taos area at the reception. 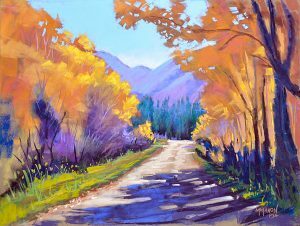 This 2019 Workshop is during a week when the Taos fall colors should be at their height. Mike will be doing outdoor and indoor demonstrations. He has had great success doing Paint-Alongs at other workshops, and wants to begin teaching this way indoors before taking the class outside. The more controlled environment is very encouraging to those who want to learn how to think in Aesthetic Categories before using these painterly techniques out in the open air. 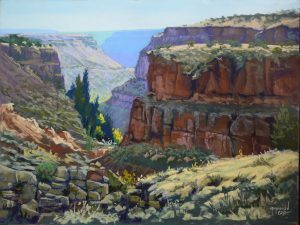 Outdoor Painting, or En Plein Air Painting, is often the goal of painters who are impressed with the wonderful light and changing colors of the Southwest. 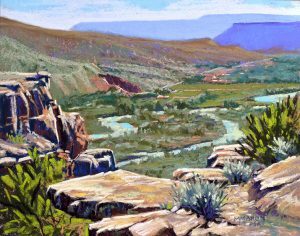 On the second day of the workshop, when students will have some studio practice under their belts, Mike will take the whole class to a Taos location to paint in the late day sun. been one of Mike’s passions, and there is no better time than in October. His en plein air impressionism captures the unique qualities of of this time of year. Enjoy the unmatched scenic beauty, many art galleries/museums and the unique architecture of this renowned art colony. To prepare you for the best possible plein air painting experience, Mike will make sure you are well prepared. He will begin with a thorough introductory PowerPoint presentation explaining the painting principles and procedures necessary for successful painting. After a question and answer session and review of everyone’s equipment, Mike will lead you in a workshop Paint-Along. In the studio Paint–Along session, Mike will supply each student with a photo identical to the one he is using. The photo will be of a Taos scene similar to what you will be dealing with when we go into the field to paint the next day. 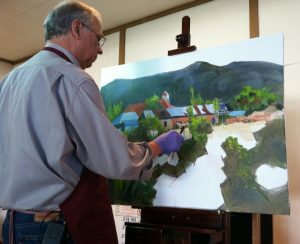 Mike will demonstrate his step-by-step painting process, stopping at each step to allow students to reproduce what they have just seen him paint. He has found that this is the fastest and most effective way to build confidence while learning his painting method. He will demonstrate in both pastel and oil, but at different times; and he will address the specific nature of any mediums used at the workshop. 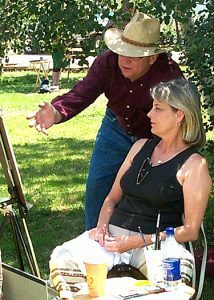 There will be plenty of plein air painting tips given along the way. 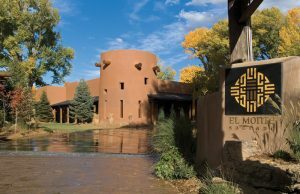 The workshop will be headquartered on the spacious second floor in the Gallery Room, overlooking the beautiful El Monte Sagrado courtyard. The Power Point presentations will be held in the cozy Library, only steps away. If you have had little or no experience painting outdoors, painting what Mike paints after he paints it will greatly increase your efficiency and confidence when we do go outside to paint. Mike will help you set up your equipment at the Paint-Along exactly the way you will need to use it in the field. This gives you an opportunity to test your equipment and painting technique under Mike’s supervision. If you find that you need any plein air painting supplies, there will be time to get them before going to our painting location. 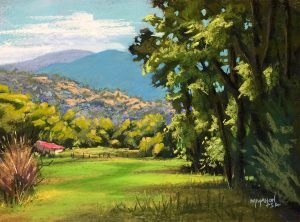 On the second day, Mike will briefly review the material he has taught and introduce specific instructions on measuring techniques, scene selection, and many plein air painting secrets. 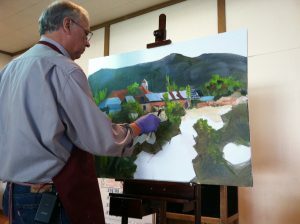 He will do another painting demonstration followed by an afternoon plein air experience for the class. 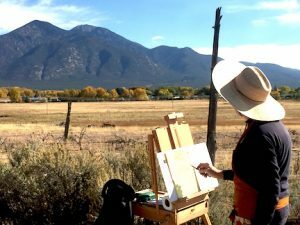 Throughout this process, you will discover how plein air painting will improve all of your artistic skills, especially your studio work. Your ability to judge values, colors, and perspective will greatly increase and you will learn how to edit what you paint to the most essential elements for the most successful painting. You will learn the joy and stress-relieving activity of painting in the great outdoors! You will also be introduced to Mike’s “DiVine Setup” ©, a 7-step systematic approach to painting based on classical principles of art which are logical, learnable, memorable. This systematic process will free you to be more spontaneous, while still in control of your painting. You will learn the necessary steps and the order in which they must be used to accomplish a good painting. Mike will teach you how to see in “aesthetic categories”. The paintings and photos you do on location will serve as great source material for studio paintings when you return home. Mike utilizes demonstration paintings, PowerPoint presentations, and personal instruction to help you every step of the way to a more productive painting experience. Each student will receive a comprehensive workbook that covers the material presented at the workshop, as well as videos of the main lecture and demo painting. All outdoor locations will be easily accessible and only a few steps from your vehicle with nearby restroom facilities. Mike will be working your artistic muscles not your leg muscles. Click the “Register” button above and you will be taken to a page where you can register and payout. The workshop fee is $425.00, plus NM sales tax and the Eventbrite ticket fee. The workshop will be 10 to 12 artists so that everyone will have plenty of personal attention. At registration, you will have the option to pay the full amount, or to put down a $100 deposit that reserves your spot in the workshop. All payments, except the deposit, are refundable until Sept. 10, 2018. After Sept. 10, no payments are refundable. If for any reason the workshop is cancelled, ALL workshop fees received by Mike Mahon will be refunded! When you have registered for the workshop, you will receive a confirmation email, with a link to the supply list. Your workshop fee includes a complete 3-ring workbook to take home, and exclusive workshop videos of Mike’s lecture on Aesthetic Categories and his Painting Demo. We are especially delighted to headquarter this workshop at the El Monte Sagrado Hotel again this year. It is Northern New Mexico’s Premier Hotel Resort. Because of the convenience, camaraderie, and luxury accommodations at specially discounted workshop prices, I highly recommend that you stay there with us. 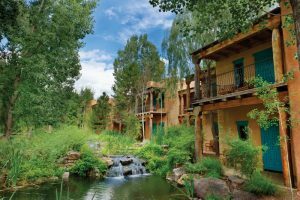 They have a block of individual casitas set aside for us at a discounted rate. However, you are not required to stay at El Monte Sagrado to attend the workshop. To reserve you room, call the hotel at 575-758-3502 and ask for the Reservations Department. 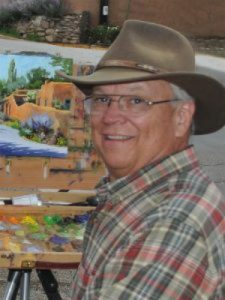 Tell them you are with the “Let’s Paint Taos” Mike Mahon Workshop. You may also go online to http://www.ElMonteSagrado.com, where you can provide the Group Code-181015LETS for reservations. * You can click here to reserve a room on line at El Monte Segrado. Please plan to arrive at the hotel by 3 pm, if possible, on October 16. 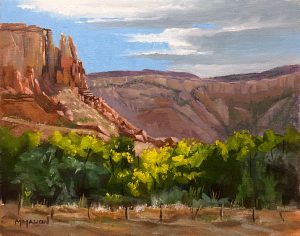 Attending the special 4:00 pm-6:30 pm reception/painting demo on the evening of October 16th is the beginning of your workshop! 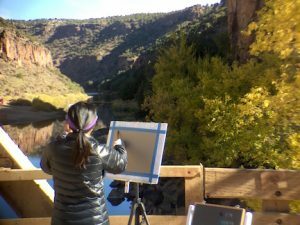 Click below to view Mike’s time-lapse video of a landscape painting demonstration with teaching comments done at Mike’s 2018 Taos workshop. This painting video has been compressed to only 9 minutes, but it includes Mike’s audio commentary explaining his painting process, along with helpful painting tips. You may view the video whenever and as often as you like. After seeing the video, click here to subscribe to Mike’s YouTube channel if you would like to see more videos as he produces them. Painting en plein air is an exhilarating and pleasurable experience. However, it has unique challenges that can be overcome by proper preparation!